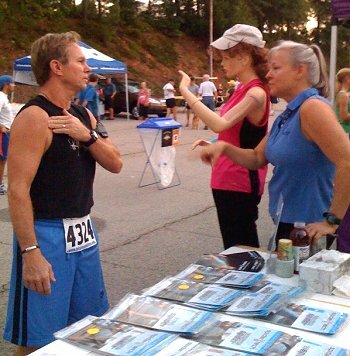 Over 550 runners participated in this year's Doug Kessler 10k / 5k race at the Sandy Springs Festival. The Absolute Health Chiropractic table was front and center of the race registration and finish line. Runners attracted to our Spider Tech taped model had ample face time with Dr. Cathy to understand how the tape assists their performance and recuperation from injury. We had a great time seeing our patients and meeting new faces! "Oh, Happy Monday!" Mirant employees look forward to the work week when their company sets up a Employee Appreciaton Health Day with Dr. Cathy. Dr. Cathy shares her expertise in chiropractic, massage therapy, nutrition and counseling in the work setting. 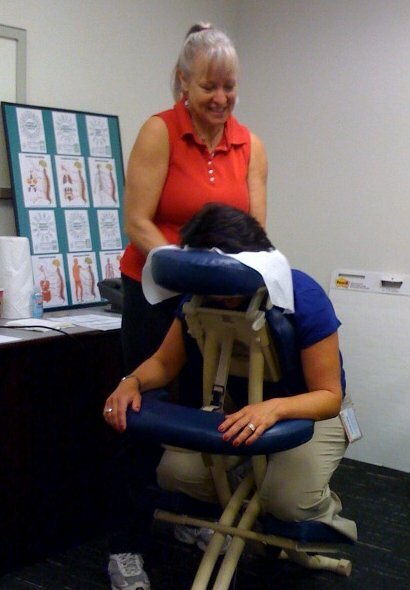 The chair massage sessions give employees a chance to discuss health issues and concerns with Dr. Franklin while receiving the therapeutic benefits of massage. It's a win - win for a company that supports an environment for healthy happy employees. Please contact the AHC office if you would like to set up an Employee Health Appreciation Day for your company.